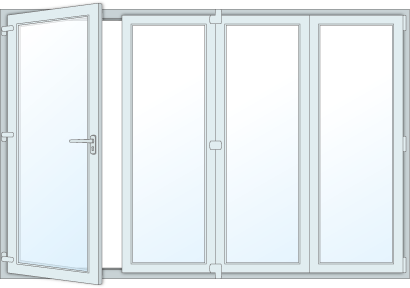 A Bi-folding door is an intelligent solution to a variety of exterior door opening challenges. EuroTech Windows is a manufacturer and supplier of high performance uPVC bi fold doors in Melbourne.As one of the leading specialist suppliers of bi fold doors in Melbourne, we have a wide range available with us. Over the years we have enhanced and improved the look of thousands of homes, creating indoor/outdoor entertaining areas with our expert bi-fold doorinstallation.With excellent design and technological advancements, bi folding doors can transform the architecture of any building’s exterior or interior. While closed, the upvc bi-fold door allows an abundance of natural light into your home with good accessibility through a single operating door. And when all the doors are open and folded away, the outside comes inside, providing ventilation in your home, a clear unobstructed view, and the versatility of creating a single large area. Our dedicated team of industry professionals can talk you through your project. Whether you require us to just supply, or provide a site survey and use our team to install, we have the required facility to help you. EuroTech Windows prides itself on producing excellent value for money with high quality products without compromising on functionality. EuroTech Windows’s bi folding doors create endless opportunities for design and add a new dimension to your home or business. 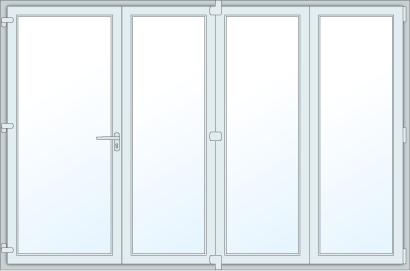 Designed and manufactured at EuroTech Windows, each and every bi fold door is bespoke and available in a wide variety. Exceptional care is taken in designing our bi folding doors for durability and long-term performance. Each and every installation of bi fold door done by us in Melbourne, comes with a guaranteed promise that we will do everything possible to ensure you have a pleasant home improvement experience. Bi-Fold windows and doors provide great security for your home through multiple locking points operable from just one handle. Keylocking mechanisms are available for this system, allowing for even greater security and better home insurance premiums. 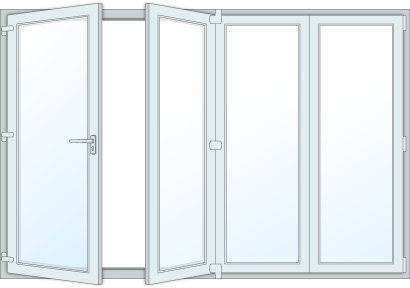 In the 4-panel configuration shown below one of the panels can operate as a standard door, without disturbing the rest of the panels. 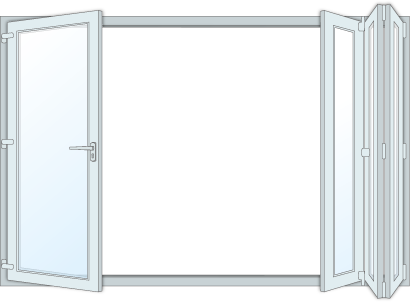 When required, two panels can be opened and used as a French Door. Both panels can be opened 180 degrees, creating a large open space. When the door is fully opened it creates a large seamless open space. The panels fold up flush with one another, maximising the opening. In this position the retractable flyscreen can be used to it’s full potential. Allowing you to have fresh air in an environment free from bugs.